Friends! 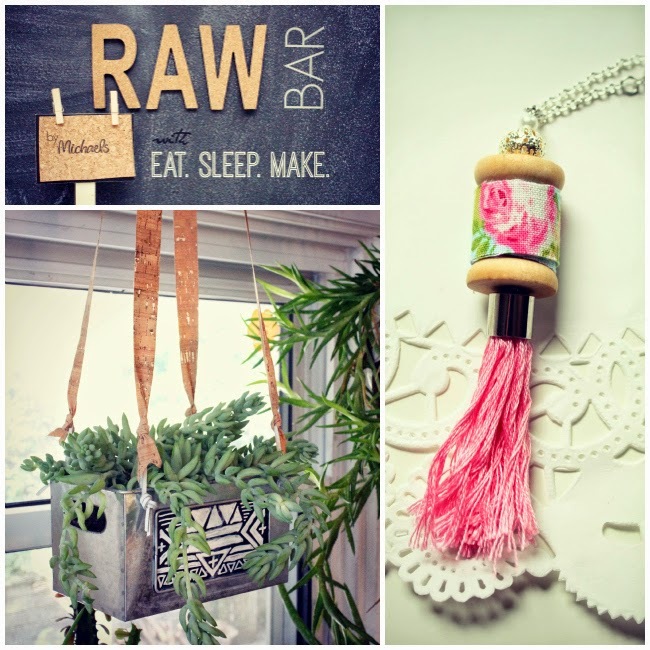 Today we're sharing our second project with #MichaelsMakers! Yay! We were fortunate enough to get a sneak peak into a new line of products called Raw Bar, debuting in all Michaels stores on August 8! 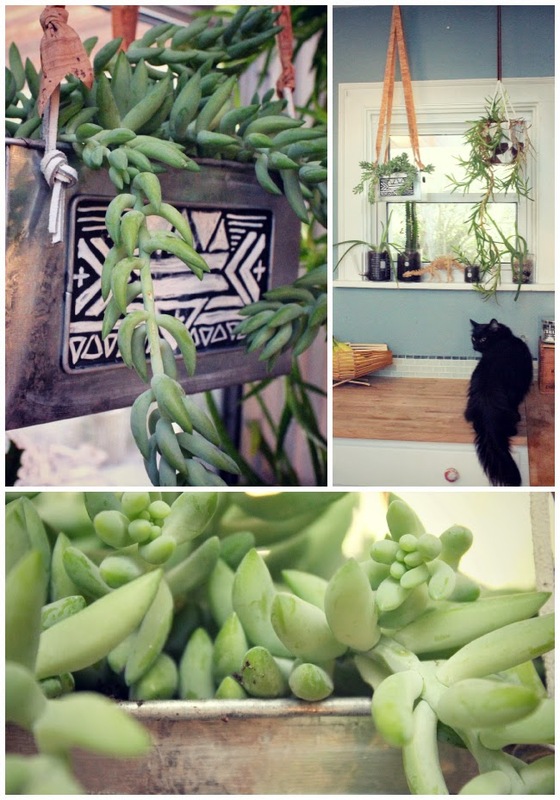 It is made of or accessorized by materials inspired by nature. 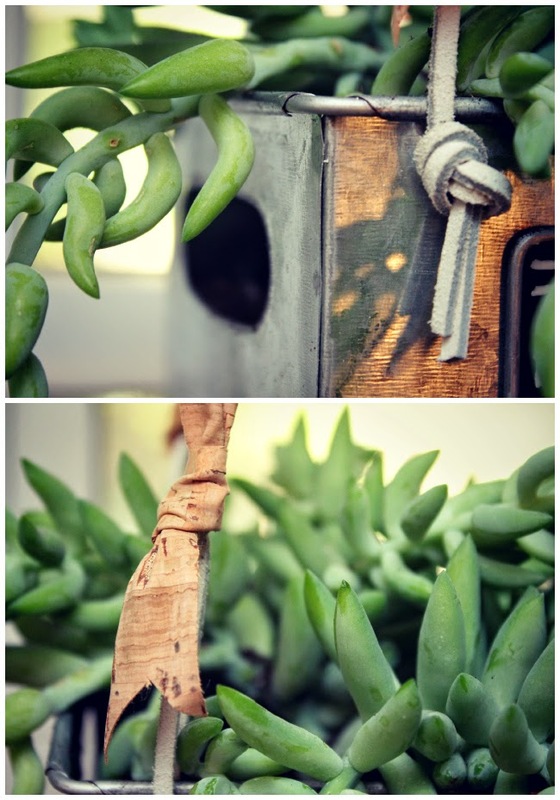 Surfaces and textures include: burlap, cork, chalk board, wood, metal and canvas. 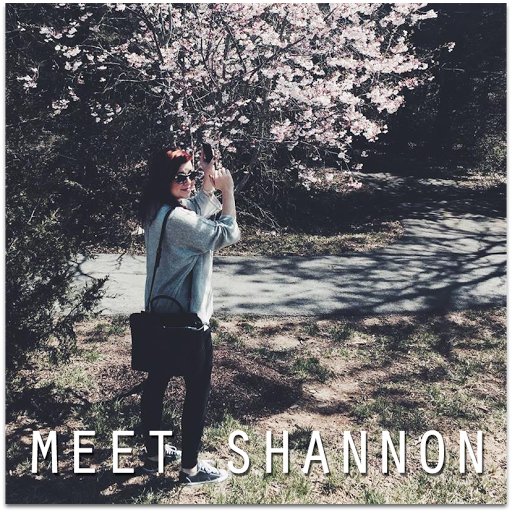 We love everything that was in our sneak peak and cannot wait to see what else this new line has to offer. Let's dive right in! 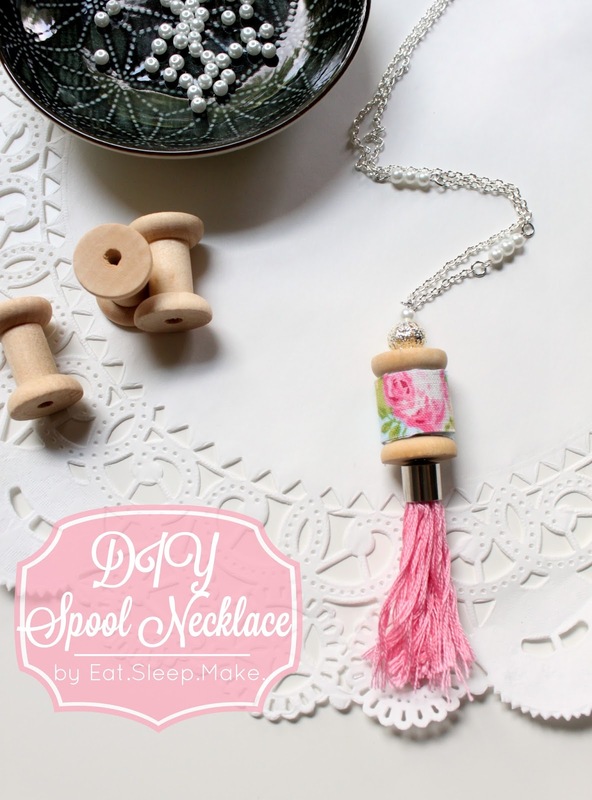 For my contribution to the July challenge, I wanted to celebrate my love of sewing with a pretty, vintage-inspired spool necklace using the wooden spools from Michael's Raw Bar line. ONE: first, lay your fabric on the table, print facing down, and apply some double-sided tape to the back. 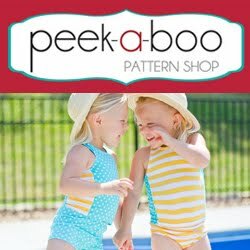 TWO: using scissors, cut your tape backed fabric to size. You'll want a piece wide enough and long enough to wrap around your spool several times. 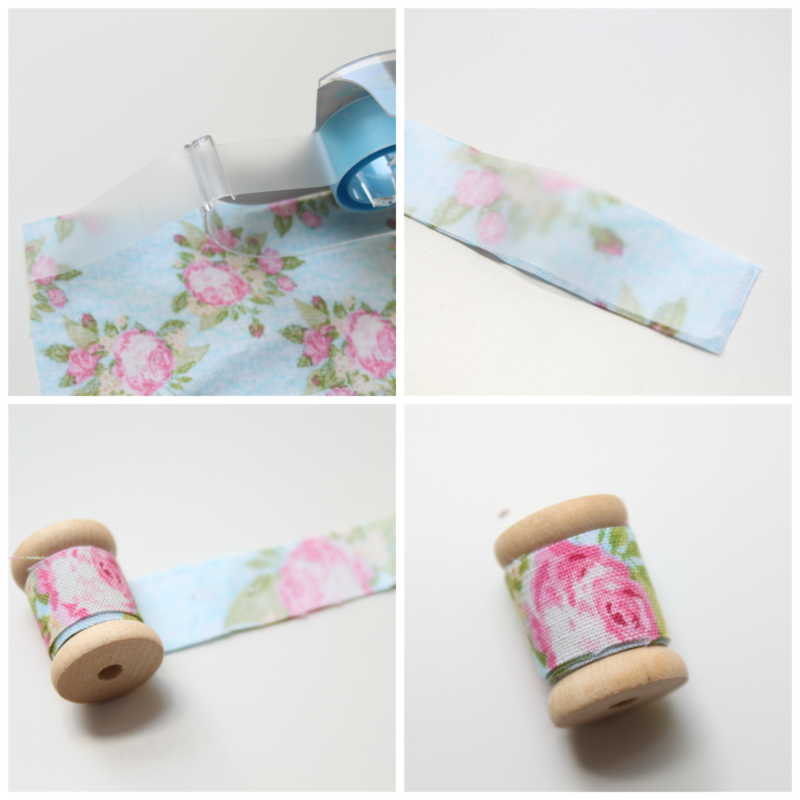 THREE: wrap your fabric around your spool, pressing lightly as you go. FOUR: secure the end of your fabric strip with a small dab of glue. 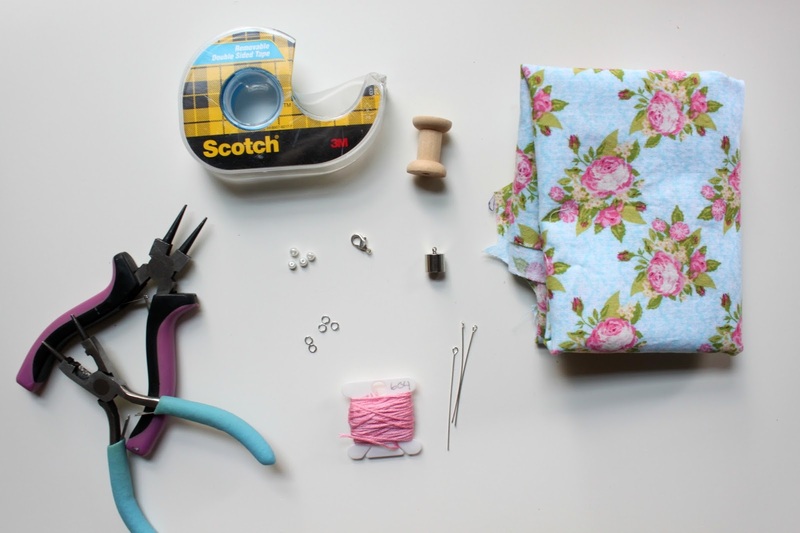 ONE: start by wrapping your embroidery floss several times around 3 fingers. 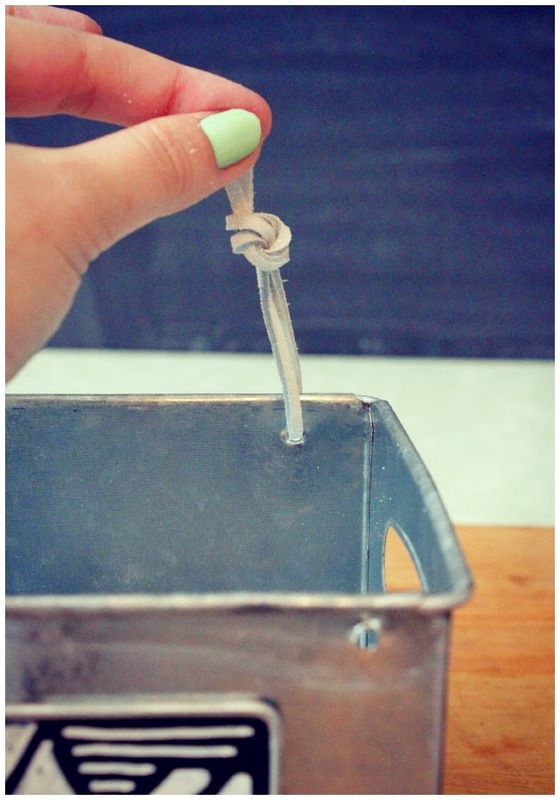 TWO: use a small piece of floss to tie a knot at the top. 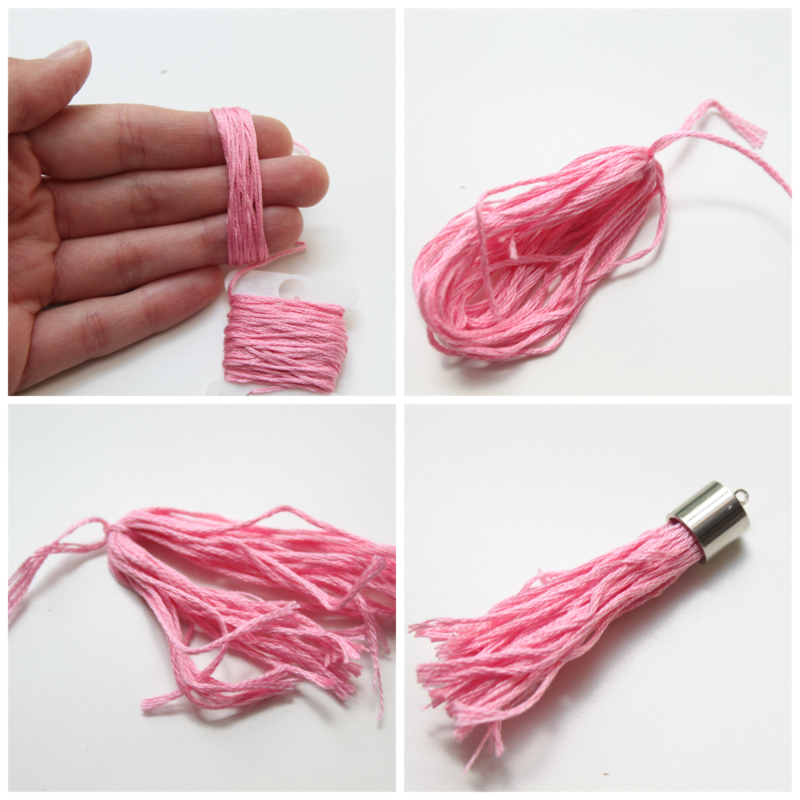 THREE: clip the bottom of your tassel with scissors. FOUR: fill the inside of your end cap with glue, and insert your tassel. Allow to dry. ONE: slide one small pearl and one silver bead on your eye pin, then add your spool. Using your round nose pliers, grasp the end of your eye pin and curve the eye pin around the pliers to make a loop. 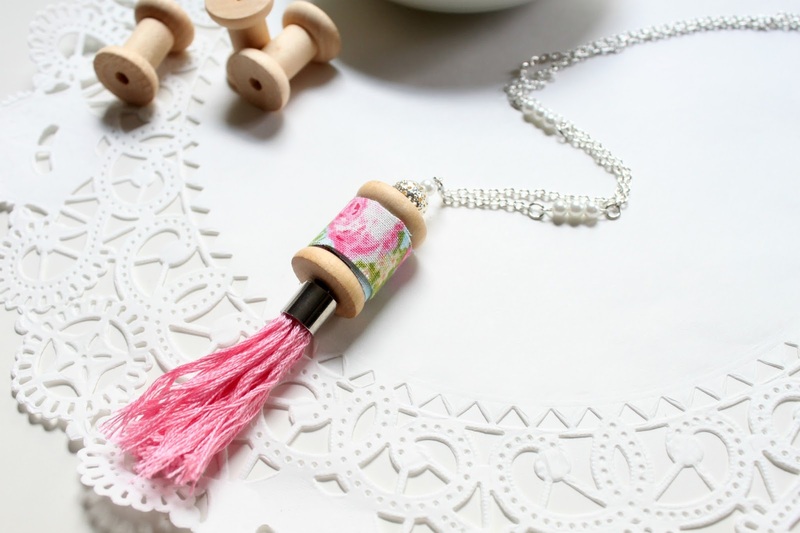 TWO: attach your tassel to the bottom of your spool using a small jump ring. THREE: slide three pearls onto an eye pin and clip the excess wire, leaving about 1/2 inch. Using the same method above, make a loop at the other end of your eye pin. FOUR: here is what your finished strung pearls should look like. FIVE: roughly 1 1/2 inches from the center of your chain, use your wire clippers to clip your chain. 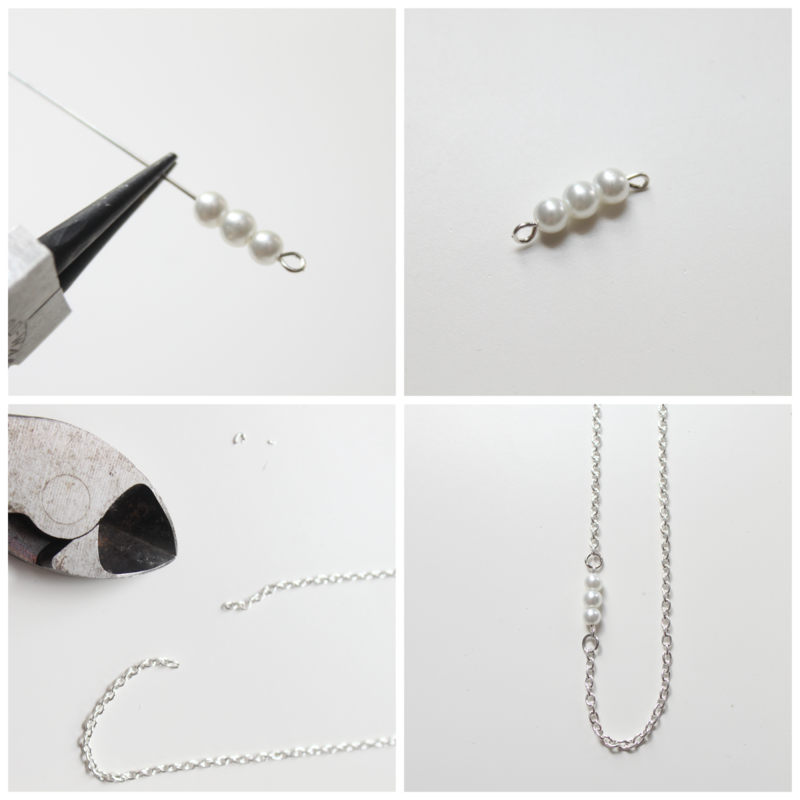 SIX: attach your pearls to the chain with small jump rings. Repeat above steps 1-6 to add a second strand of pearls to the other side, several inches higher. Finally, attach a lobster clasp to one end of your chain, and the medium jump ring to the other. Enjoy your gorgeous new necklace! When Jen and I received the box of goodies from the new Raw Bar line at Michaels we were so stoked! Everything in the box looked so scrumptious! 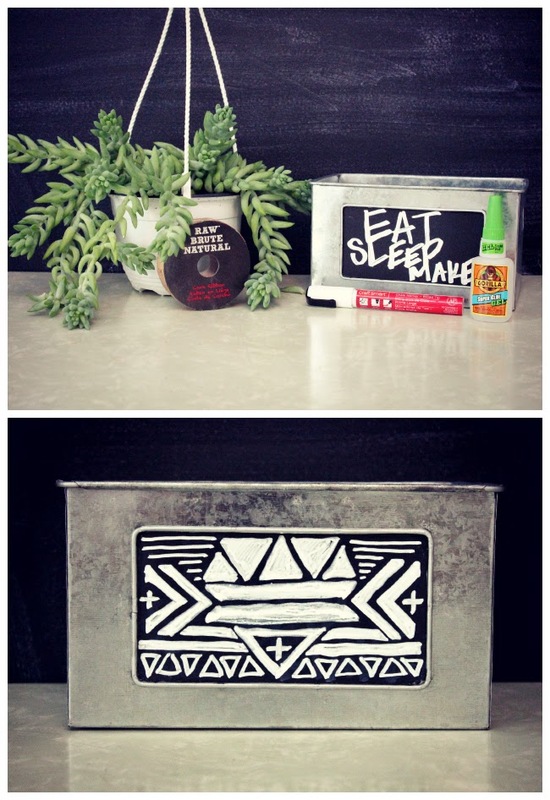 As soon as I saw this galvanized steel box, I knew it would make an awesome hanging planter. 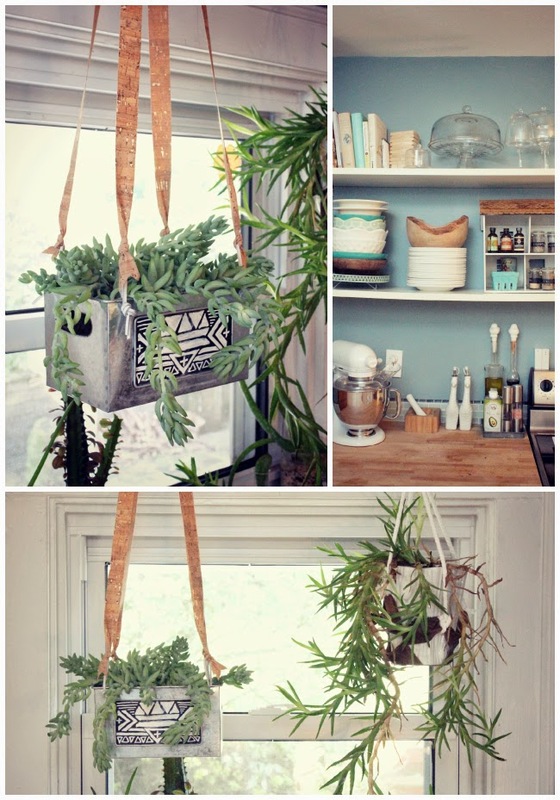 Frankly, I've run out of tabletops, shelves and windowsills to put all my plants, so I've taken to hanging them and I love the dimension it gives my window spaces. First things first. Draw something cute with your chalk marker on the chalk panel! 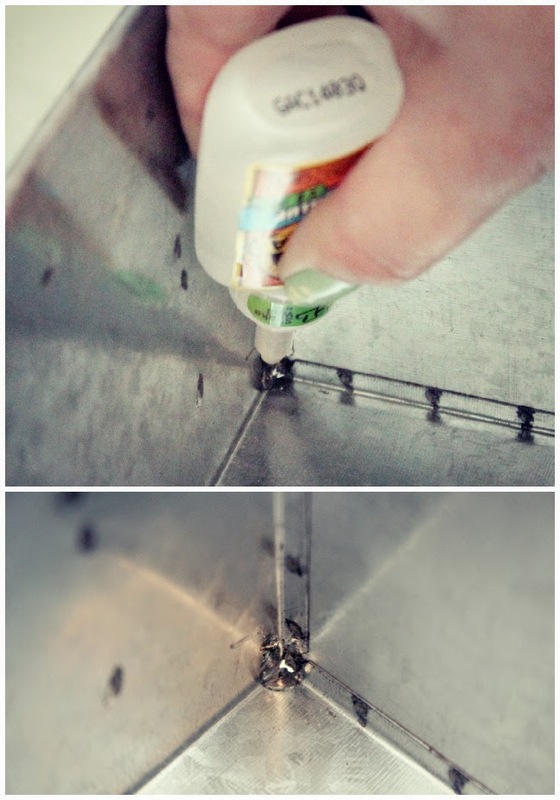 Next, you want to seal up the corners where the metal is not soldered with your superglue so you don't have water leaking out. Now, we're gonna drill holes near the corners on the front and back of the long sides. 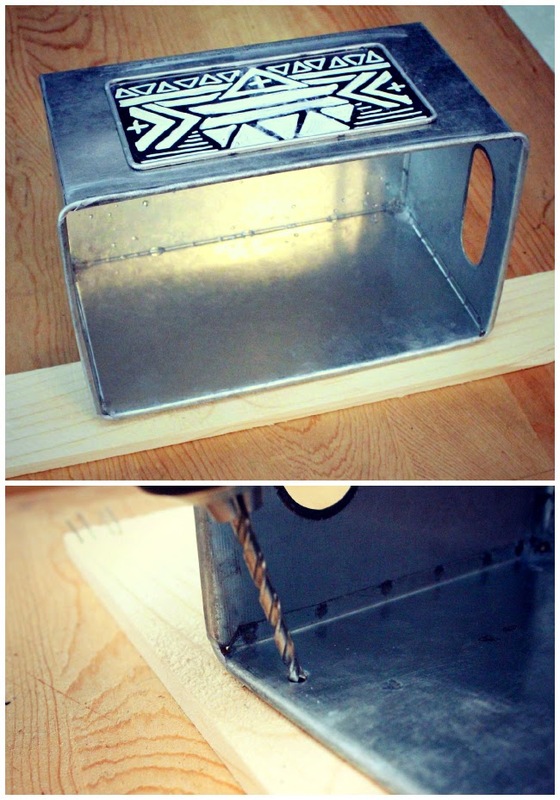 Make sure you put some scrap wood under the steel because you will have to apply a good amount of pressure to break through and you don't want to damage the surface of whatever you are working on. Now take 10 inch pieces of leather cord and tie through the holes you just drilled. This is what you will attach your cork ribbon to. I slid the knot of the leather to the bottom by the steel so you could see it. Otherwise, it was hidden by the knot in the cork ribbon. 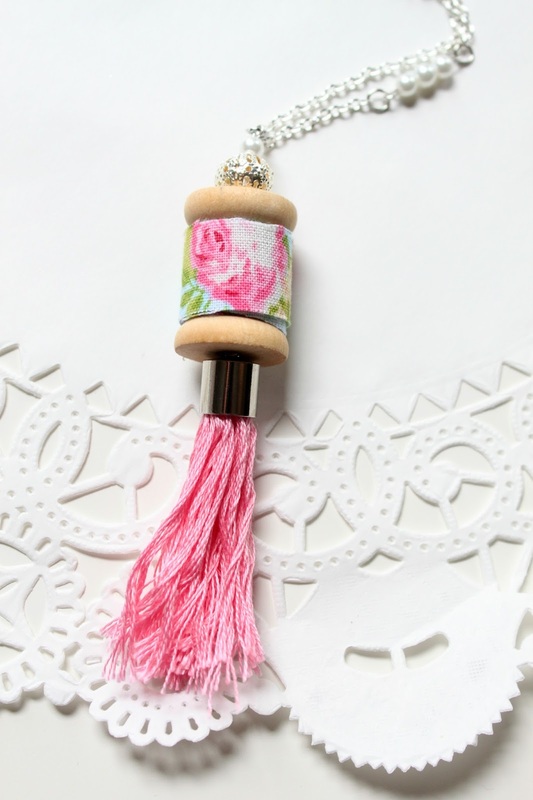 The length of your cork ribbons depend on where you are hanging this, so size appropriately! I tied from front to back on the left, then front to back on the right. 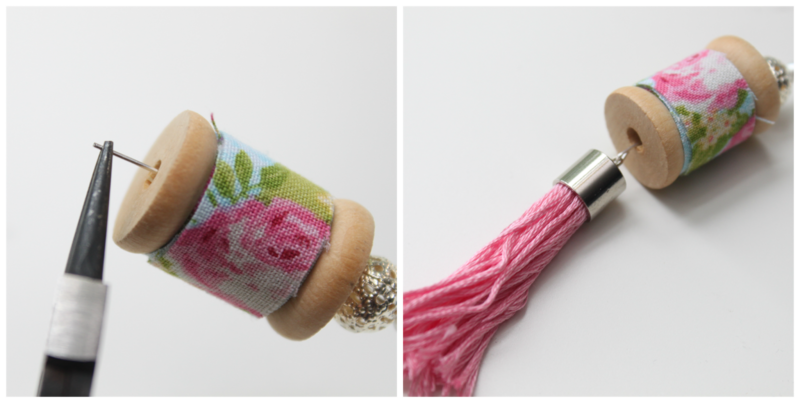 This cork ribbon is amazeballs, people. At first glance, you assume it will be fragile and delicate, but it is reinforced with fabric and holds a surprising amount of weight! 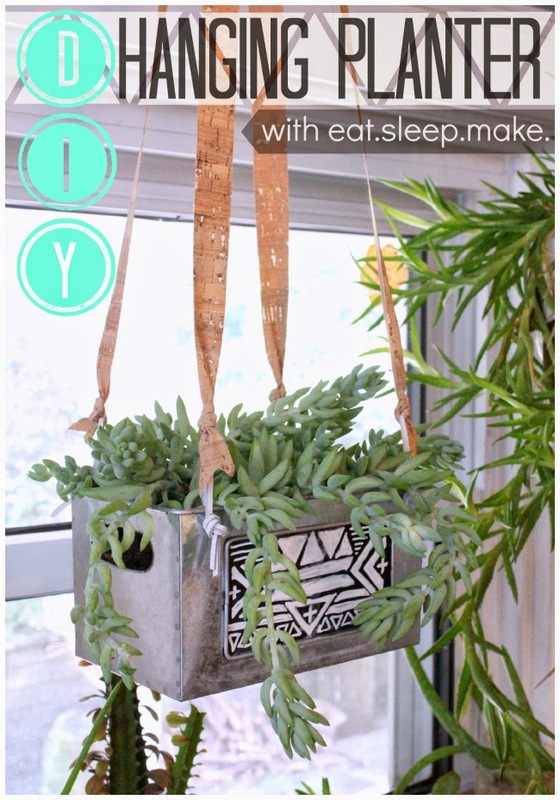 Now transfer your plant and hang it! 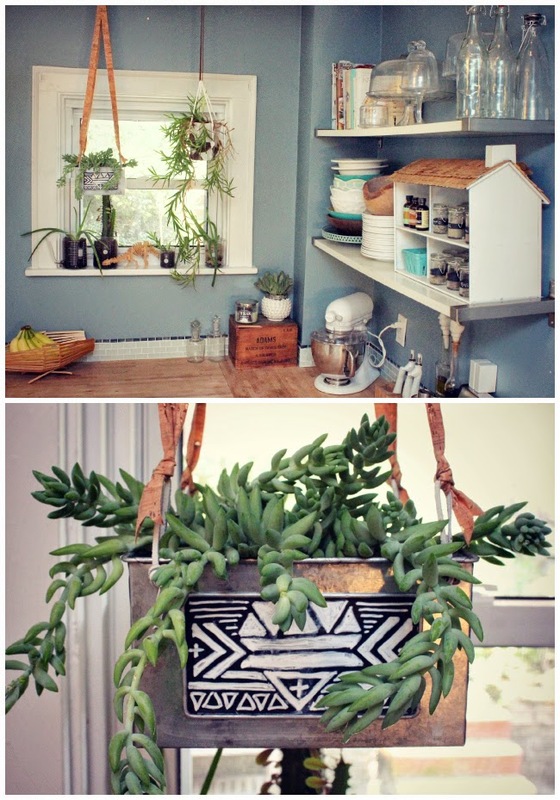 I am head over heels with my planter!! And for the record, no, my cat is not allowed on the kitchen counter, hence the mischievous glance backwards. He's a brat.